In accordance with the recent announcements of the 2019 Oscars nominees – we decided to delve into the work that goes on behind-the-scenes of the mother of awards evenings, the Oscars (or Academy Awards, if we’re to call it by its official name). Genero specialises in set design and we pride ourselves on the designs we have brought to life for many prestigious awards ceremonies across the UK. This is definitely a topic we pay attention to! Not just an awards evening, the Oscars is an event that is highly-anticipated worldwide, with a large focus on chosen designer outfits, hairstyles, jewellery and nominees. The ceremony even provides a platform for celebs to showcase their support of certain political movements. All of this takes place on the stage. The stage is the beating heart of the event and central to all of the drama, which is broadcast worldwide, live. The prestigious production designer chosen to create the Oscars 2019 stage is Derek Mclane. He’s designed over 300 productions across the world, including the past 6 Oscars! This guy is really au courant with the stage production scene. 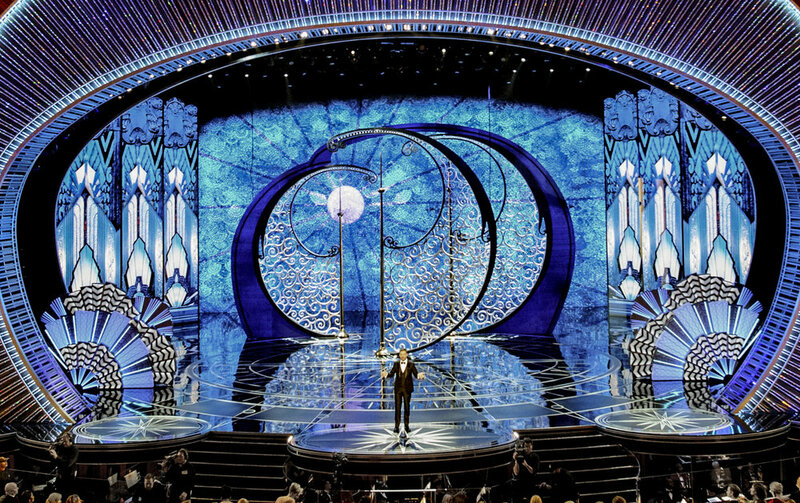 The following photos display his designs of the Oscars stage from 2013 – 2018. Mclane has managed to produce a significantly different and equally awe-inspiring design for each consecutive year – a tough task for such a ceremony. Especially one whose core traits do not change, despite its changes in other elements, such as new awards categories. The year of Life of Pi, Django Unchained, Skyfall and Les Misérables, to name but a few. The set design, with hundreds of Oscars Award figures in an arch across the stage, provided a depth to the ceremony showing much attention to detail. The dangling lights almost look like stars themselves, in keeping with the celebrity stars. Genero have partnered up with the esteemed Cardiff Life for the third year running to design their stage and production. Again, their trophies often inspire the set design, 2018’s set design mirroring the jagged lines featured on the trophies. This year we saw The Grand Budapest Hotel, The Imitation Game, Interstellar and The Theory of Everything as part of the excellent nominees. This year’s stage design is more classic, with red lighting illuminating the classic red curtain which represents performance entirely. The introduction of more colour is different to previous years. The colours are of course associated with wealth – royal blue and deep red, emphasising the class of the show. The Oscar’s trophy figure is used yet again, in silver in the backdrop of the set design, a subtle nod to the famous figurine. The year of Mad Max: Fury Road, The Revenant (Leo FINALLY got his hands on one of those well-deserved Oscars), Room and The Danish Girl as part of the nominees. This year, Mclane incorporated an interchangeable set, along with adding lighting effects to create different moods and environments, which is an idea that we at Genero aspire to. We handle the production for the National RAC Annual Staff Awards Ceremony each year. Recently, we used a circular truss as part of the changing light displays, which similarly aided in creating differing moods and environments. This year brought us La La Land, Moonlight, Moana, Star Wars: Rogue One among the nominees. 2017 also brought us a fantastic collaboration between Mclane and Swarovski, with diamonds not just dazzling the stage design but also throughout the theatre. Taking on an Art Deco theme, Mclane’s various backdrops brought several different guises again this year, the diamonds remain a focal point throughout. This year the figure of the Oscars Award was not the central focus of the stage design. In contrast, a company that may be protecting such crystals for a heist, is TEISS, who host a conference about cyber security. Genero had the opportunity to get stuck in with designing the set of this unusual event. We went for a symmetrical look, ensuring to incorporate their artwork of the pupil, engaging the audience through the feeling of being watched by very large eyes, as you can see below. Last year brought us the magnificent The Shape of Water, Dunkirk, Coco and Three Billboards Outside Ebbing, Missouri along with many other greats. A challenge for Mclane is to make a spectacular stage, without distracting from the actual celebrities on stage. Last year he really succeeded. As the 90th anniversary of the Oscars, he pulled the crystals out the bag. Try 45 MILLION Swarovski crystals. The jagged shape of the dazzling set is breath-taking whilst creating the perfect frame to emphasise the celebrities standing underneath, at the centre of the design. Derek Mclane’s designs provide a bit of inspiration for Genero. We love how he incorporates glamorous twists such as a collaboration with Swarovski into his designs – maybe one day for Genero, always aim high! If you’re reading this and like the sound of us and our work, contact us at info@genero-group.co.uk, or click here to visit our website!